First Time Cruisers-Cruise Like a Pro! 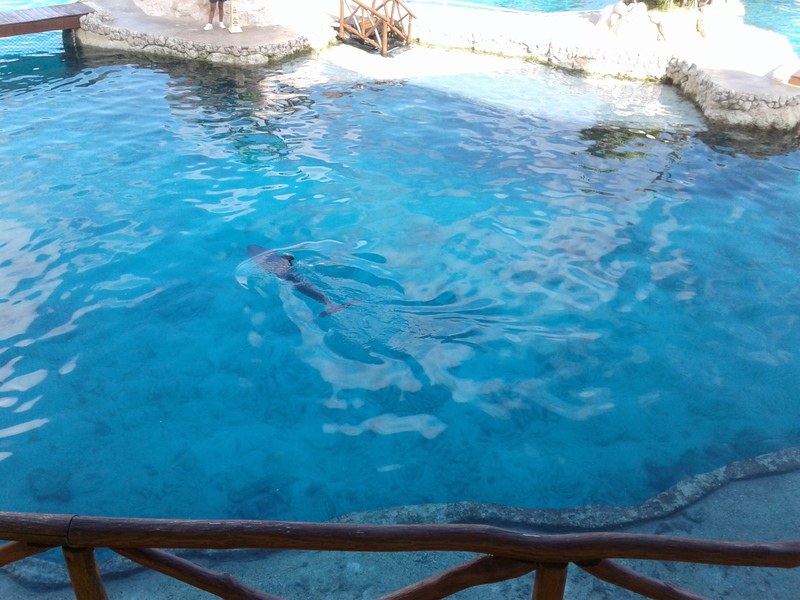 Dolphinaris Cozumel Review….should I swim with a Dolphin? I understand that not everyone thinks that Dolphin exhibits and shows are humane, but I want to give my honest view on my visit to Dolphinaris Cozumel, and my conclusion. I have always loved Dolphins, they are one of my favorite things in the world. And I’ve always wanted to see one up close. I’ve seen them in Tampa Bay before, but that’s just not the same. So, we booked a Dolphin Encounter at Dolphinaris Cozumel during our last cruise so I could see one up close and personal. My first thought of Dolphinaris was that it was smaller than I thought that it would be. It is a clean and nicely taken care of place, but there’s not a lot of room there. We waited for our group to be called in the buffet area. We sat there for about 15 minutes before our group was called. While waiting we could watch others in their interaction with the dolphins. I could see that the water in the pools was very clean, and I could watch the trainers with the dolphins. They were very patient with both the dolphins and the visitors, and the facilities were also very clean. Once our group was called, we were told that we had to shower to wash off any sunscreen or lotions that we had on us. I knew not to put on sunscreen ahead of time, so we were okay. We were also told to take off all jewelry so not to scratch the dolphins. We also knew this ahead of time, so our jewelry was all in the safe on the ship, including wedding rings. There are lockers that you can rent for $15, but they’re not necessary. There are covered bins right by the dolphin area that you can put your things into. They are safe and you can see them from the water. You can wear water shoes in the dolphin encounter area, although the bottom was sandy and comfortable, but you cannot wear water shoes if you do a dolphin swim. We chose to do the Dolphin Encounter, which did not include a swim with the dolphin. I can see where it might be stressful for a dolphin to have someone grab onto his fin so he can pull them across the pool, and then do it over and over again and I’m glad we didn’t do that. But I am also glad that I got to spend some quality time in the water with our dolphin, GoldenBoy. He was a beautiful and gentle animal. We got to touch him, and get a kiss from him, and there’s no other way that I could get so close to this beautiful animal. We did a few of the trainer moves to get him to perform. We did not hurt him. I could see that his trainer loved him and took care of him, made sure that we interacted with him carefully, and educated us on dolphins and their lives. The dolphins do one show, and then get to rest for the next one. Dolphins swim in spurts throughout the day because they have to keep moving, and the trainers made sure that they get their sleep time. The dolphins seemed healthy, and the water was clean. The pools are not huge though. There is a ledge along the side so that the visitors can stand on them, and it gets deeper in the center. There was also another pool where the younger dolphins are kept, which is away from the tourists. You can see it from the bar area. The trainers will work with them down there, and it looked like they were having fun playing. 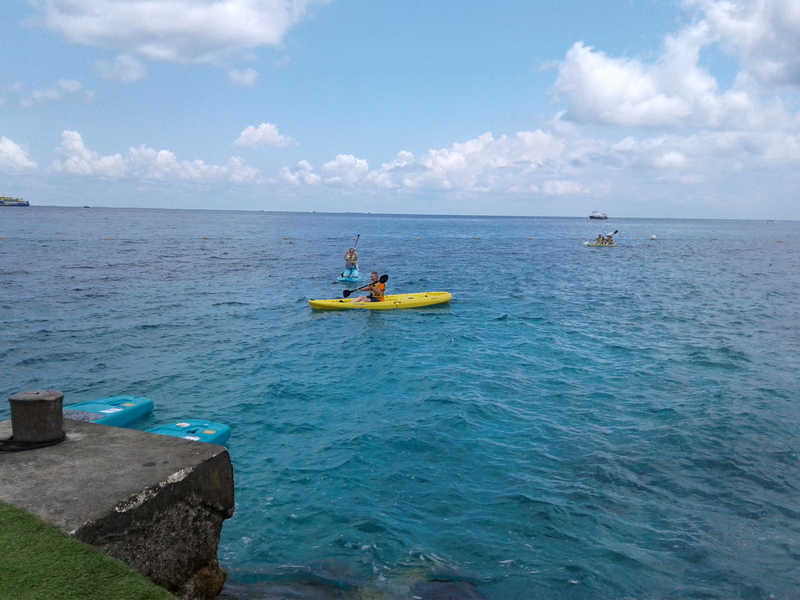 Along with the dolphin encounter, you can kayak, paddle board, or snorkel. My husband decided to try kayaking, and said it wasn’t hard. I made the mistake of deciding to snorkel because the area looked pretty shallow. I’m not a strong swimmer. I was handed a mask and snorkel, but I was in the water alone. I started into the water but it only took a minute till I saw a large stingray coming at me which startled me. I backed away, and soon felt a stinging on my toe. I thought that maybe the salt water was bothering a blister, but the pain kept getting worse. I backed up to where I could sit down and look at it and saw some sort of a stinger in my toe. I pulled it out but it still hurt, so I got out of the water. The lifeguard asked if I was okay and I told him what happened but he just walked away. Then the lifeguard that was watching the kayakers asked if I was okay and I told him what happened so he told me to sit down and wait for my husband. After my husband got back to shore he had to try and find first aid because my whole foot was throbbing by then and my two toes were red and swollen. Finally he found someone with vinegar but by then it was too late to stop the pain. A place with snorkeling and stinging water life should be keeping first aid right by the snorkeling area, and be trained to use it. So, nevertheless, my trip to Dolphinaris started out well with my dolphin encounter, and ended up horribly. The food at Dolphinaris was just okay. Nothing spectacular, a small buffet with some Mexican food and some American food. They do have a drink machine for soda and ice. Of course I was in pain at the time so nothing would have tasted good. There are birds everywhere while you’re trying to eat. Do not leave your plate or they will be on it. The busboys are very good at cleaning up the dishes as people finish so that the birds can’t get into them. The area is clean. We didn’t get sick on anything. The open bar drinks are delicious. I had two Miami Vice’s and my husband had a Long Island Iced tea. I was a little nervous about getting sick on the ice since that had happened to me in Roatan, but we did not get sick, so the drinks are safe. The ice also came in handy for the pain in my foot. There are photographers everywhere in the dolphin area, and the pictures are outrageously expensive. I think that they should include one picture in the package, which costs plenty itself. They lead you right to the picture viewing area as soon as you’re done with the dolphins. We looked at them and then snuck out. No way we would pay that for a picture, even if I would have liked one. You cannot take a camera with you to the dolphin area. You can take pictures from the other areas. So, my views on dolphin exhibits…It is sad that these dolphins are born into captivity, but so are zoo animals, and if we didn’t have zoos we would never see most animals in the world. I don’t think that “swimming with a dolphin” is a good idea, I don’t know that it’s non-stressful for a dolphin to be pulling a heavy weight around like that. I didn’t feel like we were hurting the dolphin in the encounter, however. We were watched very carefully, and we could tell that the trainers were very careful of their dolphins and cared for them. We saw that they were given a rest between shows. We saw how clean the crystal clear water was, although I would have liked it if the pools were bigger than they were. But with my experience with the water creature sting, I’m pretty sure that the dolphins were taken care of much better than the visitors. And what stung me and what was it doing in a place where tourists would be standing? I realized after I got home that I had left the go-pro filming while I was having the problem. In looking at the video, the sting either came from a baby stingray, or a snake-like creature that I hadn’t noticed while I was in the water backing up from the large stingray. I tried looking the creature up on the internet, and the closest that I could come to it was a Bearded Fireworm. I think that most likely it was the Fireworm since I had the stinger in my toe. I don’t know if Dolphinaris knew it was there, or if it came in the small fenced off lagoon through a hole in the fencing. All I know is that it probably wasn’t a good place for it to be. If you go snorkeling there, definitely wear water shoes. I don’t think that flippers were provided. And bring vinegar or Adolph’s Meat Tenderizer, just in case. The entire staff of Dolphinaris was friendly, but I think that they need to be a lot more prepared in case of a medical problem. I have emailed them suggesting that the lifeguards be more trained in first aid and prepared in the snorkel lagoon area. Share my links on the Social Media below! This entry was posted in cruising, Reviews and tagged addicted to cruising, cabin, Caribbean, cruise blog, cruise food, cruise port, cruiseblog, cruising, dolphin, freedom of the seas, hsp, introvert, quietcruiser, royalcaribbean, ship on May 24, 2018 by The Quiet Cruiser. Halloween on a cruise ship! With Hurricane Florence on the way…what should I know when cruising? Why does The Quiet Cruiser like Disney’s Magic Kingdom so much? Virgin Voyages’ Scarlet Lady….there’s going to be a new ship in town! And she’s adults only! I don’t want to gain weight on my cruise…what can I do? Why would I choose to forfeit my Carnival Cruise Deposit? Addicted to Cruising? Get help here…but is that what you really want? It’s Hurricane Season Again…what should I know when cruising? The Best Places in the World to Visit on a Cruise! What is a Ship’s Tender? Check out these blogs from The Quiet Cruiser! We're on our way! Watch for my daily blogs.